NCSSEF, ODF&W Enhancement Program and FEMA funds were used to rebuild the Siskeyville slide on the Wilson River. 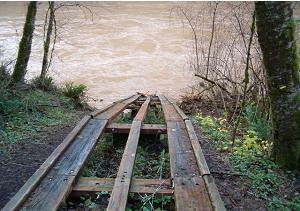 The previous slide was old and required almost yearly maintenance and the November 2006 flood caused significant damage requiring full replacement. The new slide is built to stand up to the rigors of heavy use and the environment.